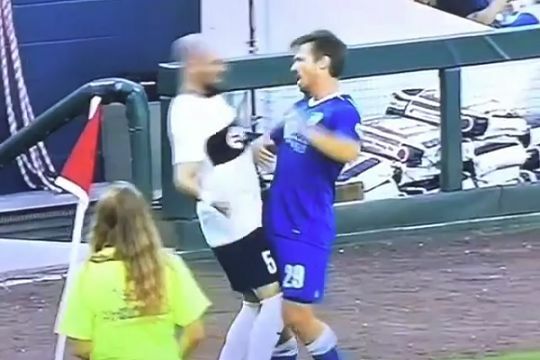 Opposing players both dived simultaneously following a clash of heads during Saint Louis United’s 2-1 win over Reno 1868 in the United Soccer League. Reno had already been reduced to ten men when the incident occurred during the first half of the US second tier match at Greater Nevada Field on Sunday. The two players involved were Antoine Hoppenot for Reno 1868 and Kyle Culbertson for Saint Louis, who went on to seal the win with an added time goal. Their head coach is one Anthony Pulis, not to be confused with Middlesbrough manager Tony Pulis.